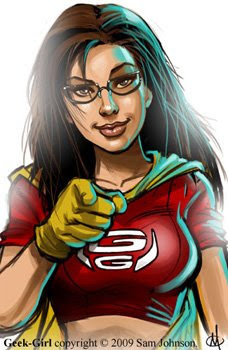 So I got an email from comic book guru Sam Johnson the other day informing me of - wait for it - a comic strip based on a Geek Girl super-hero! Now, mind you, it has absolutely NOTHING to do with this blog or me or any of my videos, but I just thought it was really cool and something that you guys should definitely check out! 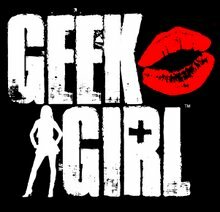 Click HERE (or on the image above) to read an interview with Sam Johnson about the genesis of his Geek Girl and the concept behind it. There are also links in that article to how you can check out the comic itself. Working on the new Video NOW! Need your input! It's that time again...I'm prepping to shoot next week's episode of GeekGirl and it's going to be ALL about social networking. What I need from you is to email, comment or Tweet at me with your favorite/most visited/most used social networking sites and applications! Or, email me and tell me that you will never set one virtual foot in any of them (but if you feel that way, make sure to tell me WHY so that I can understand!) Lastly, if you have any questions about Facebook, MySpace, Twitter or LinkedIn, those are the main categories I will be focusing on, so send in your questions!